Hot-shot equestrians, whether English or Western schooled, are welcomed into college programs around the country. Even the Rodeo scene includes some hotly contested scholarships. Now an Emerging Sport in the NCAA, equestrian pursuits are drawing more and more attention from scholarship administrators, as equestrian programs position themselves to attract top talent. Winning is a collaborative effort between horse and rider, but much of the success in equestrian sports lies with rider nuances, including equitation or appearance, and horsemanship. Stand-out riders open doors to scholarships to some of the best academic universities in the country. 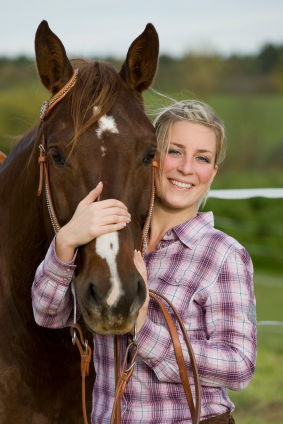 Use your passion and equestrian skill to land access to college. The NCAA offers some excellent tips on preparing for recruitment, including this suggestion: Riding videos submitted to campus equestrian programs for review should demonstrate your skill level, but also your versatility. Your attire should accurately represent the standard for whatever equestrian style you are engaged in. NCAA requirements include registration with the athletic Initial Eligibility Clearinghouse. Remember to follow recruitment rules, like the one prohibiting student-athletes from communicating with college coaches prior to their high school junior years. When you’re shopping for an equestrian team, it helps to know which programs offer your equestrian class: hunter seat (including flat and fences), western, eventing, and dressage. The Intercollegiate Horse Show Association, Inc. maintains a comprehensive regional listing of college equestrian teams, as well as statistics about each school’s equitation class and team size. The NCAA limits equestrian scholarships to 15 per college or university–Div 1 and Div 2—that operate programs according to the NCAA Emerging Sport of Equestrian Women’s protocols. Equine scholarship eligibility requirements vary across individual schools, so interested applicants are encouraged to contact individual programs for the most current information. As an NCAA Equivalency Sport, equestrian programs are allowed to divide scholarships into partial awards, as a way to distribute scholarship dollars among greater numbers of players. There are some very well-respected and fiercely competitive equestrian programs among Division III colleges, but athletic scholarships for D3 schools are prohibited by NCAA rules. In order to draw top talent, Division III colleges use alternative scholarships that reward students for academic performance. As a rule, scholar-athletes are well-positioned for landing college aid, but it is imperative to put forth a strong GPA if you expect to get a scholarship at a strong equestrian school in Division III. Financial need also plays a role in evaluating scholarship candidates at Division III colleges. Stand-out riders, with financial hardship and strong high school transcripts are marked for scholarship assistance. The Race for Education Scholarship Program assists horsemen and women pursuing related education, including agriculture disciplines and animal stewardship. The Horseman’s Scholarship and The Thoroughbred Scholarship are awarded to deserving students, who are evaluated based on background and income. Age and GPA are additional selection criteria for annual awards valued at up to $6000 each. Additional Race for Education scholarships are offered in collaboration with agriculture education groups like 4-H and others. Locust Trace High School offers its own program, as well as The Washington State Thoroughbred Foundation. Students across the United States are eligible for Intercollegiate Equestrian Foundation Scholarships, which are awarded annually at the IHSA National Horse Show. Qualified applicants are in financial need for higher education, and exhibit strong histories of equestrian experience and involvement. Undergraduates with strong academic transcripts are encouraged to apply. The Knox School in New York offers equestrian scholarships worth $1500 each for students participating in their first year of equestrian competition. Student applicants are evaluated based on performance in three key areas: Community involvement, academic achievement and extra-curricular participation. All grade levels are eligible, and applications are accompanied by original short stories that employ horses as characters. Texas A&M Aggies are eligible to compete for the 15 annual scholarships allowed by NCAA Division I regulations. The funds are distributed among the 60 players on the roster, according to the coach’s designations. Black Hawk College provides Equine Scholarships for its noted equestrian program. Among two-year colleges, Black Hawk produces some of the highest caliber show teams and horse judging teams. Western schools emphasize rodeo in some cases; so if your passion lies there, consider colleges like the University of Wyoming – where rodeo stand-outs qualify for financial assistance. The multi-faceted appeal of equestrian sports and hobbies draws riders, breeders, handlers and trainers – each requiring specialized education. Professional horse handlers, stable managers, and riding instructors cut their teeth in competitive college programs and equestrian club-sports across the country. Worthy riders and other agricultural professionals compete for scholarships that reward academics, commitment and horsemanship.